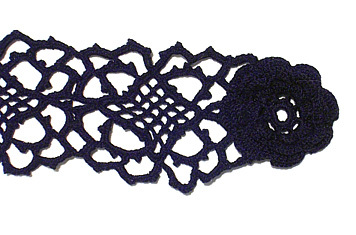 This choker uses Venetian Crochet motifs taken from a vintage tablecloth pattern (Needlecraft, December 1916) and a rose from an Irish Crochet collar and cuffs set (Needlecraft, November 1914). Choker is 12" long but can be lengthened by additional rows or by adding motifs. Size of finished choker can be affected by substituting other yarns and/or crochet hooks. The directions are to crochet the motifs together as you go, but the motifs can also be crocheted separately, blocked, then sewn together with matching thread. 1. 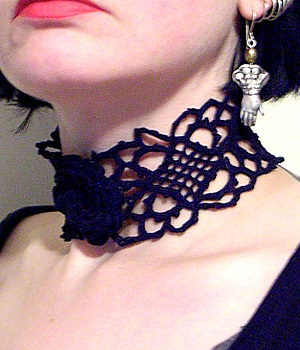 To make it about 3 inches longer, make the choker with five motifs. 2. To make it about an inch longer, add a repeat of rows 10 and 11 on the right and left side of each of the four motifs. 3. You can play with adding even more repeats of rows 10 and 11 if need be. Wide silk ribbon in a contrasting color can be sewn to the back of choker when you are finished if desired. 2: Double crochet into 8th chain from hook, (chain 2, skip 2 ch, 1 dc) 4 times. This makes 5 spaces. Turn. 3: Ch 5, dc into dc, (ch 2, dc into next dc) 3 times, ch 2, dc into 3rd stitch of turning chain. Turn. 4, 5, 6: Same as 2nd row. This will make a square grid 5 spaces wide and 5 spaces tall. 11: Fill each loop of 10 chain with (4 sc, picot) twice, 4 sc. [Fig 5] This makes one corner of Venetian motif. 1:	Chain 8 and join into ring. Sc into ring 24 times. 2:	Chain 7, (skip 2 sc, dc in next sc, chain 4) 7 times, join to 3rd of 7 chain, forming 8 loops. 3:	In each loop work 1 sc, 5 dc, 1 sc. 4:	Chain 5, fasten with sc between petals making sure chain falls behind petal, repeat around. 5:	Work 1 sc, 7 dc, 1 sc in each chain loop. 6, 8, 10: Work the same as 4th row, increasing chain 1 stitch each row. 7, 9: Same as 5th row, adding 2 more dc to each petal each row. Fasten thread. Block foundation motif strip, pinning out picots. Darn in any thread ends. Try on strip and center rose over ends. Sew rose to one end of strip. Overlap rose onto other end and mark areas for fasteners. Sew hooks and eyes (or snaps) carefully, making sure they do not show through the crochet.